Washington, D.C., is competing against its suburbs in Virginia and Maryland for Amazon's second headquarters. 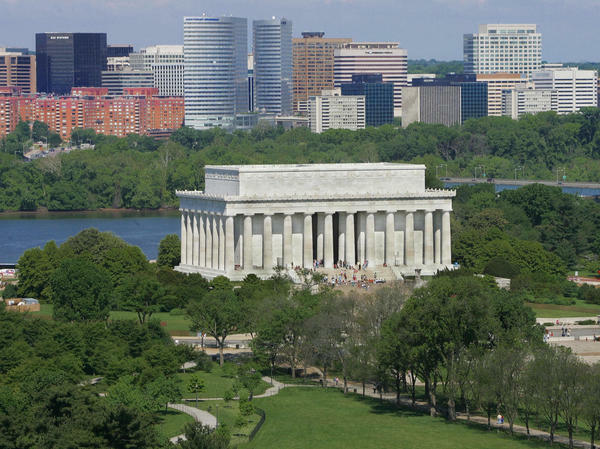 The skyline of Rosslyn, Va., is seen behind the Lincoln Memorial in Washington, D.C. Rosslyn is located in Arington County, a participant in the HQ bid from Northern Virginia. When it comes to the Olympic-style bidding for Amazon's second headquarters, the nation's capital and its neighbors could have joined together in a united front. Instead, the District of Columbia and the suburbs of Maryland and Virginia decided to compete against each other. As Amazon is working to whittle down the 20 finalists to a new shortlist in coming weeks, cities are abuzz with the company's megapromise of a $5 billion investment and up to 50,000 jobs paying an average of $100,000 a year. Several major metropolitan areas, like Denver and Dallas, came together with their neighbors to create a unified pitch to woo Amazon. But the Washington metro area — the city and two of its suburbs in Northern Virginia and Maryland's Montgomery County — is sitting on three of the coveted spots vying to be Amazon's second home. And that's after Amazon eliminated a fourth bid from the region, which came from an entirely different D.C. suburb in Maryland. "I call us frenemies," says Victor Hoskins, with a laugh. He's the director of economic development in Arlington County, which participated in the Northern Virginia bid for Amazon. But he has also worked for the city of Washington and for Maryland. And he has another word for the region's relationship: "coopetition." When it comes to the actual bids, Maryland has come out swinging. The state has approved one of the country's largest publicly disclosed incentive packages — tax breaks and other perks for Amazon worth $5.6 billion. Virginia has not disclosed its financial incentive package. The District of Columbia did share documents in response to WAMU's open-records request but redacted more than two pages' worth of details. The Washington region is considered a strong contender to host Amazon's second headquarters — thanks to the area's shared qualifications. All three finalists' pitches tout many of the same perks, such as the airports of Virginia and Maryland, the District's free museums, the regional subway system, lots of universities and the highly educated workforce. And, if Amazon chose D.C., its 50,000 jobs would inevitably draw workers from the entire region — while the overall regional economy would benefit from the prestige. Plus, Amazon's bidding instructions to cities state: "We encourage states, provinces and metro areas to coordinate with relevant jurisdictions to submit one (1) [request for proposal] for your [metropolitan statistical area]." 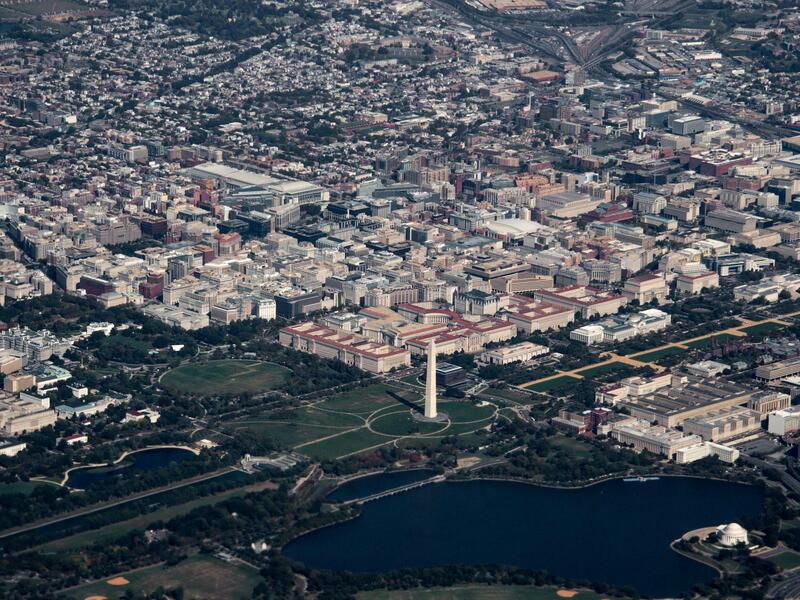 But the nation's capital is a little different from other metropolitan areas with big suburbs. Washington suburbs belong to different jurisdictions, and sometimes to different states. That means different taxpayers and different mayors and governors who want to bring home their own bacon. "You have to see that you can't confront the challenge alone," Hoskins says. "You have to see you've got to confront it together. ... It's not an easy [conclusion] to come to." Early in the process, a regional group of 300 elected officials from the area, called the Metropolitan Washington Council of Governments, broached the idea of the entire region pooling together on one unified bid. But Amazon gave them a tight deadline — just six weeks. And the regional divides ran deep. The effort proved short-lived. Hoskins says it takes a major breakthrough — something like tackling the regional subway system — to persuade separate municipalities to spend their taxpayer money on a joint mission that benefits other jurisdictions. It took Washington, Maryland and Virginia more than 40 years to agree on dedicated funding for the regional Metro. The bottom line is that even if the whole region benefits from Amazon's presence, only the winning location gets the most tax benefits, such as corporate income and added property taxes, local officials say. "Nobody's going to share that," says David Iannucci, director of economic development in Maryland's Prince George's County, which wraps around the District on the eastern side. Prince George's County was behind that fourth — now rejected — pitch from the Washington metro area. Iannucci says the Maryland governor's office essentially told all interested counties to submit individual bids. Only one made the cut. Iannucci says Amazon told his county that it didn't make the finalist list because it lacks senior software development engineers. His county, ironically, is the one with the University of Maryland, College Park, which is known for its top-rated computer science program — one that's definitely mentioned by the three finalist bids from the region. "The reality is that Maryland, Virginia, and Washington, D.C., are much more than just neighbors. We are partners. ... In many ways, our jurisdictions have embraced a shared vision for the future." The letter stopped short of endorsing any one location. In a statement, Washington's deputy mayor, Brian Kenner, struck the same pro-region sentiment: "We know that if Amazon chooses the Washington region for its second headquarters, it would provide jobs and economic opportunity across the region, including in the District of Columbia," he said. "If one wins, we all win." Amazon, for its part, declined to comment on specific proposals, but a spokesperson said the company is working with each candidate city "to dive deeper on their proposals and share additional information about the company's plans." And for now, that means Amazon has to choose among not just 20 metropolitan areas but three neighbors in one of them. Though some folks around Washington would say, that's three times the chances of winning. NPR's Ian Wren contributed to this report. Martin Austermuhle is a reporter at member station WAMU in Washington, D.C.
OK. The suspense goes on. Amazon is soon going to announce a new shorter list of locations it is considering to host a second headquarters, and the bidding race is super competitive. At stake are some 50,000 jobs with an average salary of six figures. The bids from the Washington, D.C., area really stand out for a particular lack of teamwork. NPR's Alina Selyukh met up with Martin Austermuhle from member station WAMU. He's been covering the politics of wooing Amazon. ALINA SELYUKH, BYLINE: Martin and I are on a bridge behind a landmark transit hub in Washington, D.C. It's called Union Station. This is a fast-growing neighborhood, one of several being pitched for Amazon's HQ2. MARTIN AUSTERMUHLE, BYLINE: Union Station is behind us. The train tracks kind of stretch in front of us heading north out of the city. SELYUKH: How far are we from Maryland and Virginia here? AUSTERMUHLE: I think five or six miles in any one direction. SELYUKH: In another universe, the District of Columbia and nearby parts of Maryland and Virginia could easily be one giant city. Everyone here rides the same Metro, comes out to the same baseball and football games, either works for the federal government or knows someone who does. But when it came to wooing Amazon, three parts of this one metro area - Washington, Northern Virginia and the Montgomery County in Maryland - decided to compete. AUSTERMUHLE: It would stand to reason that this is exactly the sort of place - these are elected officials that interact on a daily basis - they could've sat down and had a conversation and said, listen, we all want Amazon HQ2 to come to the region. Let's not make it more expensive for each of us individually by one-upping each other with incentives. SELYUKH: It did happen in other large metro areas. For example, places like Denver or Dallas drew the entire region into one pitch. In fact, Amazon encouraged local governments to join forces for a unified bid. But the nation's capital is special with so many suburbs belonging to two completely different states and so different taxpayers and different governors who all want to bring home their own bacon. VICTOR HOSKINS: You have to see that you can't do it alone. You know, you can't confront the challenge alone. You have to see you've got to confront it together. SELYUKH: Victor Hoskins is with Arlington County, Northern Va. He says it takes a major breakthrough, something like tackling the regional subway system to convince separate states to spend their taxpayer money on one joint mission. HOSKINS: That's the kind of conclusion that the jurisdictions have to come to, and it's not an easy one to come to. People sometimes can't agree on what movie to go to. SELYUKH: Hoskins has a word for the relationship in the region. HOSKINS: Co-opitition (ph). And I call us frenemies. SELYUKH: And not just any kind of frenemies but frenemies who generously borrow each other's backyards. All three finalist bids around here tout many of the same perks - airports in Virginia and Maryland, universities and museums in D.C. and some of the smartest workers in the country. And what I haven't mentioned yet is that there was a fourth bid from the D.C. metro region, one that didn't make the finalist list. It came from Maryland's Prince George's County. Economic Development chief David Iannucci says they crafted their own pitch because Maryland's governor basically told all counties to fend for themselves. DAVID IANNUCCI: So I think there's a very strong chance we didn't make the cut because of the way that happened. IANNUCCI: They cited the No. 1 reason that we didn't make the cut was an absence of senior software development engineers. IANNUCCI: It's like saying your teenage date, take me back. SELYUKH: Lately, the three D.C.-area finalists have been taking great pains to say that they aren't actually rivals. The governors of Maryland and Virginia, along with the mayor of Washington, wrote a letter to Amazon CEO Jeff Bezos reassuring him they are, quote, "much more than just neighbors." They say they are partners with a shared vision for the future. Meanwhile, Martin has been digging into how the three are competing financially. AUSTERMUHLE: Maryland is offering one of the biggest buckets of money that anyone knows about - some $5 billion worth of tax breaks and other perks. We don't really know what Virginia is offering. And D.C. shared a document about its financial incentives but redacted some of the juiciest details. SELYUKH: The bottom line is this for local officials - even if Amazon's workers come from the whole region, and even if the whole region benefits from the prestige, it's the winning location that gets most of those sweet tax dollars. And that's why Amazon now has to choose not just among 20 metro areas but three neighbors in one metro area, though some folks around Washington would say that's three times the chances of getting picked. Alina Selyukh, NPR News. Transcript provided by NPR, Copyright NPR.